Thailand's currency is the Thai Baht (THB). 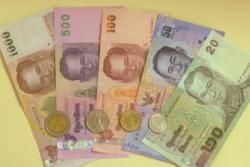 Notes are denominated into 1000, 500, 100, 50 and 20 Baht notes and coins are denominated into 10, 5, 2 and 1 baht coins. The Baht is sub-divided into Satang (100 satang = one bht), although the Satang coins are rarely used.